Itteringham is in the North Norfolk district. It is north of Oulton and south of Wickmere. Mannington used to be a separate parish, but was consolidated into one joint benefice and one rectory on 17th March 1780 after the joint petition of Lord Walpole and the Reverend Mordaunt Leathes who both held livings in the gift of Lord Walpole. It was judged that the livings together make a moderate provision for a minister. The names of both villages derive from Old English. Itteringham means ‘homestead of the followers of Ytra or Ytri’ and Mannington can be translated as ‘enclosure associated with Manna’. Both are also recorded in the Domesday Book. This states that there were two mills within the land of Mannington. The Mannington and Wolterton Estates occupy a large part of the parish. Extensive fieldwalking and documentary research into this landscape by Alan Davison have revealed a sequence of occupation and activity from the Late Neolithic onwards. The earliest recorded finds are a number of Neolithic flint axeheads (NHER 6660, 6662, 28025 and 28945). Other Neolithic flints were recovered during the fieldwalking but these were wide spread and not particularly numerous. The cropmarks of a possible Neolithic long barrow (NHER 29764) have been identified. Recently the discovery of a plan showing the line of some post medieval walls lining the drive to a house suggests the marks may have been produced by these buried wall foundations rather than a prehistoric monument! One possible Bronze Age ring ditch (NHER 18099) has also been identified on aerial photographs. Pieces of Iron Age pottery (NHER 28539, 28696, 28697 and 28901) were recovered during the fieldwalking survey. These were fairly widely scattered across the area, but they were all located on higher ground overlooking the Bure and Mannington valley floors. The lower, more waterlogged parts of the valley were avoided. A metal detectorist recovered a mystery copper alloy object (NHER 35100) that may be an Iron Age yoke terminal. Several small concentrations of Roman finds have been identified as likely sites of Roman settlement (NHER 11339, 25877, 28903, 28905 and 28906). At one of these sites (NHER 11339) pottery and metalwork finds suggests there was activity from the 1st to the 3rd century AD. These finds include the ‘Itteringham hoard’ (NHER 11339), containing over one hundred Roman coins, fingers rings, cosmetic sets and a key. Two of the sites are associated with cropmarks of rectangular enclosures (NHER 11339 and 28903). Other Roman finds have been made including one site (NHER 28024) where pottery, coins and a tiny Dolphin brooch were recovered. Coins (NHER 28901 and 28028) and pieces of pottery (NHER 28901) have also been found in other fields. There is evidence for Early Saxon activity southwest of Mannington Church (NHER 28022) and on the old border between Mannington and Itteringham parishes (NHER 28533). These sites may have been the location of Early Saxon settlement. This grew into Middle Saxon Mannington and there is evidence here for the beginnings of the later medieval village of Mannington (NHER 28022 and 28539). Activity here intensified during the Late Saxon period. Parts of the ruined Mannington Church (NHER 6663) may be Late Saxon. The site of another Late Saxon church, St Nicholas’ Chapel (NHER 12525) has been identified from cropmarks. This church was demolished in the 14th century. Metal detectorists have recovered a Late Saxon bridle cheek piece terminal (NHER 28024). Late Saxon pottery (NHER 28026, 28545 and 28898) has been found at several other sites. 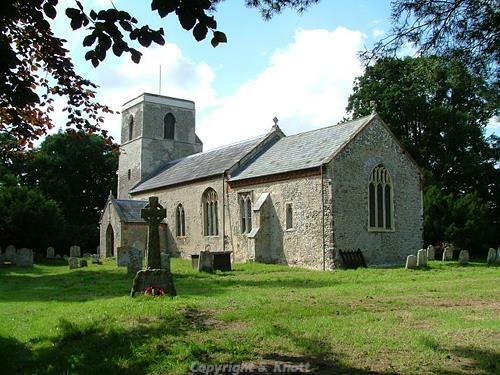 Medieval Mannington was a thriving settlement located south and west of the church and yet by 1841 only 13 people were registered as living in the parish. The site of the settlement (NHER 28539) has been located by fieldwalking. The small quantity of medieval finds suggests that this was already a declining settlement although money was provided in 1350 to remodel the church (NHER 6663). The medieval moated manor, Mannington Hall (NHER 6690) was built around 1460, close to the church. By the time it was built it seems the village was seriously in decline. By 1565 the village had disappeared to be replaced by pastoral land divided into small ‘closes’. Fieldwalking has recovered a scatter of medieval pottery from north of the church (NHER 28030) indicating that medieval Itteringham may have been much larger than the modern village, stretching along the valley of the Mannington stream. St Mary’s Church (NHER 6694) mostly dates to the 11th and 12th centuries. It was renovated and the tower was added in the 14th century. The medieval stocks and whipping post (NHER 12686) from the village are now in the Norwich Castle Museum. Nowers Manor (NHER 31891) may have been a second focus of occupation and activity (NHER 28697 and 28698). Two deer parks (NHER 30433) occupied part of the southeast of the parish. In the post medieval period these deer parks were replaced by the designed landscape of Blickling Park (NHER 30433). Mannington Hall also had a park (NHER 30471). It was planted and planned in the 15th century. This medieval planting has been replaced by 19th and 20th century gardens that are open to the public. Wolterton Park (NHER 29604) is an early 18th century landscape park surrounding mid 19th century formal gardens. These are also open for visitors. Manor House (NHER 12685) was built just east of Itteringham village in 1707. A brick octagonal summerhouse (NHER 22728) belonging to the manor was built in 1765. Itteringham watermill (NHER 6695) was possibly built in 1778. It is definitely marked on Faden’s map of Norfolk made in 1797. It has now been restored and converted into a house. It was used by the RAF as accommodation for pilots and during World War Two became an officers' mess for staff based at RAF Matlaske. Megan Dennis (NLA), 13 April 2006.
http://www.edp24.co.uk/Content/Features/SpookyNorfolk/asp/NorthNorfolk/Mannington.asp. Accessed: 13 April 2006.
http://www.norfolkmills.co.uk/Watermills/itteringham.html. Accessed: 13 April 2006.
http://www.norfolkchurches.co.uk/mannington/mannington.htm. Accessed: 13 April 2006.
http://www.itteringham.com/home.html. Accessed: 13 April 2006.
http://www.norfolkmills.co.uk/Watermills/itteringham-cirk.html. Accessed: 13 April 2006.
http://www.roll-of-honour.com/Norfolk/Itteringham.html. Accessed: 13 April 2006.
http://www.manningtongardens.co.uk/. Accessed: 13 April 2006.